This promotional golf umbrella is one of a kind. It breathes new life to the user as it is a new generation type of umbrella. It is a mixture of creative design and high-quality material; both available at a much affordable price. This is the best tool for you to use when you are thinking of promoting your business brand across the market. The use of the product as a means to promote our business brand is a proven one thus it is ideal to use this umbrella considering its qualities. The umbrella is ideal for sports activities such as golf where you spend almost half of your day standing under the sun. 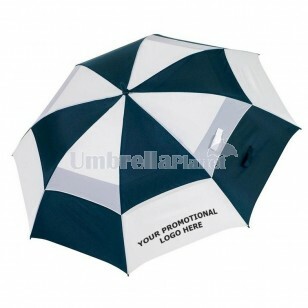 A chequered umbrella that comes with a beautiful design that will make your client’s heart dance. The umbrella is manufactured using high-quality full fibreglass shaft which is robust against winds. The canopy consists a 190T top grade showerproof fabric nylon. Attached to the canopy are dual Velcro closure bands. It comes with a nylon bag that is waterproof making it easy to carry your wet umbrella around. Standard delivery period takes up to 2 weeks while fast delivery can be arranged upon your request. $60 is charged as a setup fee per order. Note that delivery is done only in Australia and prices exclude GST but include one colour, one position print. The currency used in prices is Australian.